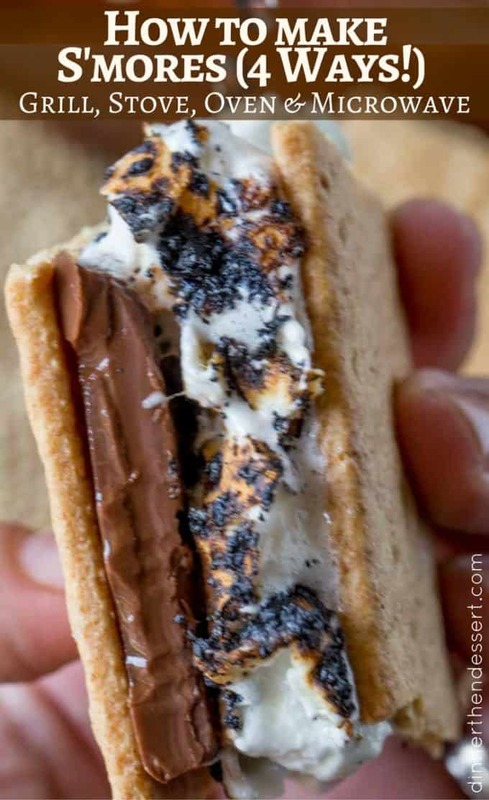 How to make S’mores that will take you back to your childhood on the stove, in the microwave, in the oven and on the grill. How to make S’mores? I know that seems like an easy answer, but there are actually a few ways to make them and they’re all delicious and different! 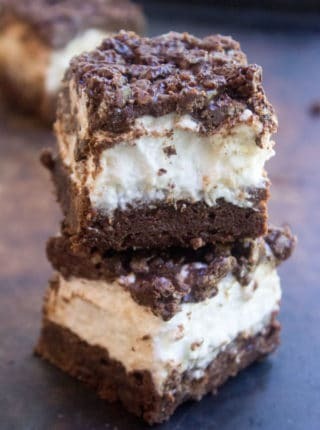 However you choose to make them, the best part is the melty marshmallow and chocolate all swirling together in the perfect “sandwich.” People often overlook making S’mores part of their bbq’s and cookouts in favor of other desserts because they think you have to make them one at a time. Some of the methods of cooking take no time at all and can even be made in volume! 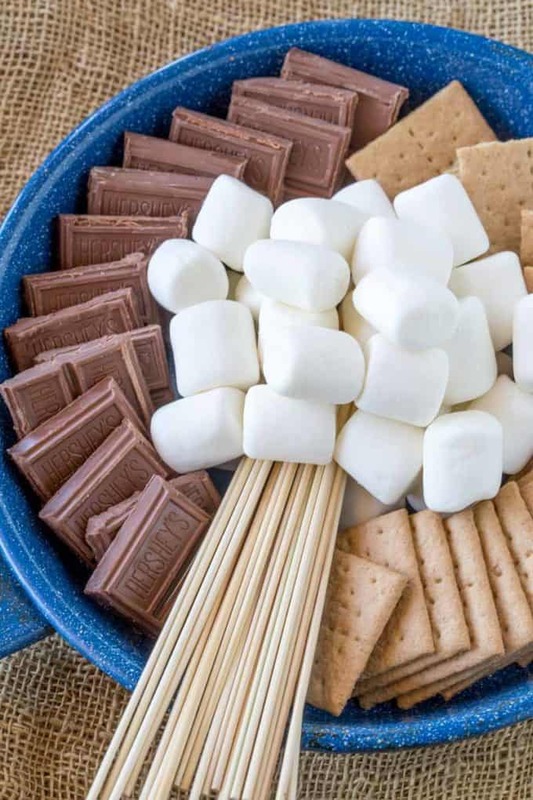 The basics have always been the same, graham crackers, chocolate (milk is by far the most popular type of chocolate) and as much marshmallow as you can stuff into the s’mores! How do you make a S’more? The most basic answer is you break a graham cracker in half and lay the two halves on a plate. Top with a square of chocolate (If using a Hershey’s bar this would be 2 rectangles). Then have a marshmallow, heated up that you add to the chocolate and top with the graham cracker. How do you make S’mores in the oven? On a sheet pan add your graham cracker halves (leave an inch of space or so around the graham crackers as the marshmallows will expand). Top with the square of chocolate. Top the graham crackers with a marshmallow, either jet puffed size, jumbo or the new stacking marshmallows. Place on a rack 5-6 inches below the top of the oven. Leave the door open 3-4 inches so you can peek in. Watch for 20-30 seconds for them to char and expand. Remove from the oven and cover with additional graham crackers and serve. How do you make S’mores in the microwave? Just a note, in a microwave you won’t have any of the delicious parts that have been charred. On a plate add the graham cracker half, cover with a square of chocolate. Top the graham crackers with a marshmallow. 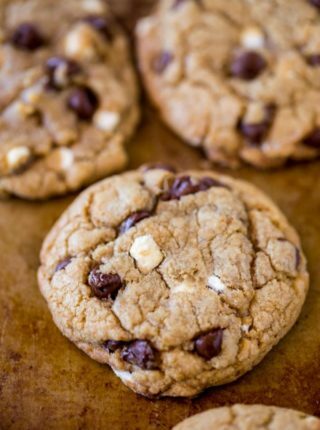 Top with graham cracker half and enjoy immediately. How do you make S’mores on the stove? Using a skewer, turn you gas stove onto high heat and hold the marshmallows over the flame. Let the marshmallow “catch” fire for a couple of seconds before blowing it out and turn off your stove. Using the second graham cracker square, put the marshmallow over the chocolate, press the graham cracker over it while taking the skewer out. How do you make S’mores on the grill? Using a skewer, turn you grill onto high heat and hold the marshmallows over the surface but not touching it. Let the marshmallow “catch” fire for a couple of seconds before blowing it out. 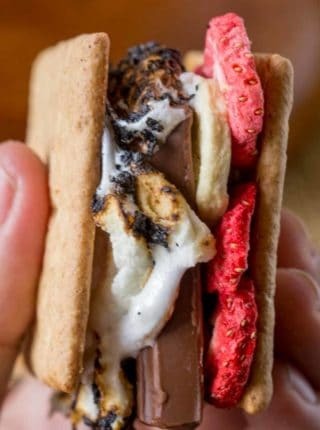 Alternate fun ideas for S’mores? Use Oreos instead of graham crackers and make S’moreos (these are a family favorite). Put a small spoonful of peanut butter under the chocolate for chocolate peanut butter S’mores. Swap out the chocolate for a spoonful of chocolate hazelnut spread. 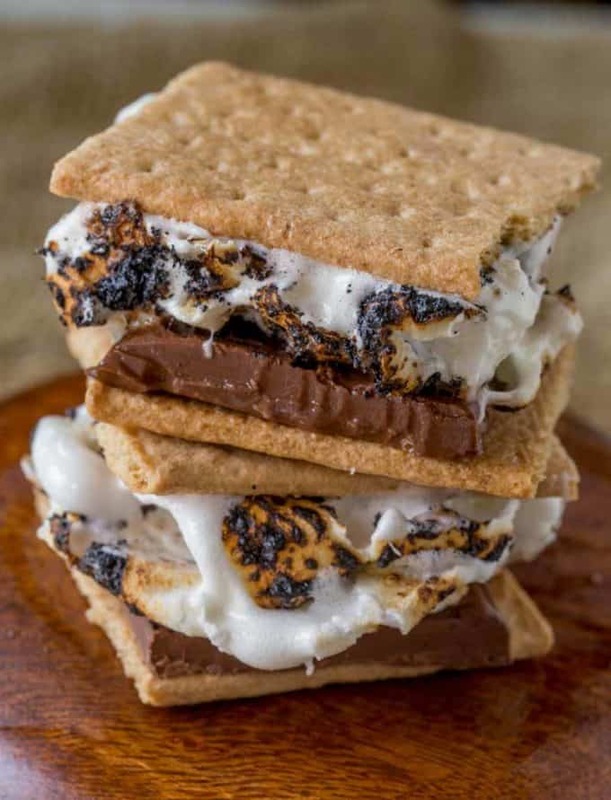 If you want to make room temperature S’mores, you can make them ahead of time, let them cool or put them in the refrigerator, then dip them in chocolate! 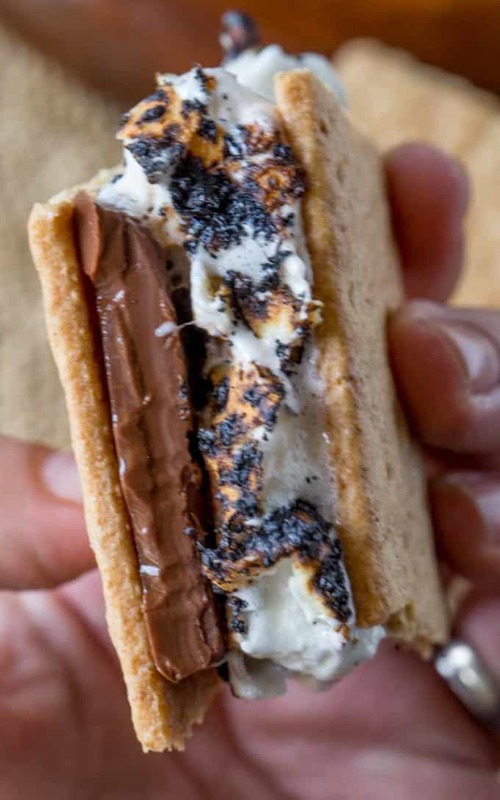 How to make the perfect S'mores that will take you back to your childhood on the stove, in the microwave, in the oven and on the grill. Top with a square of chocolate (A Hershey’s bar this would be 2 rectangles). 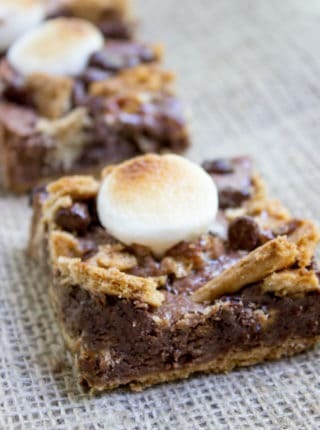 Then have a marshmallow, heated up, that you add to the chocolate and top with the graham cracker. So, the chocolate doesn’t melt too much in the oven? Nope, just keep an eye on it. OMG! 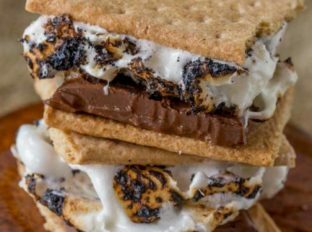 I love eating s’mores, but I don’t really know how to make it and this article is really helpful. I will try to make some of it with my friend this weekend. Awesome idea’s, thanks a bunch! ? I always wondered what other options there were for at home instead of just campfire! No better way to celebrate Summer! You definitely need options for these babies! My kids love s’mores! We usually make a big batch in the oven, but stovetop sounds fun, too. You can never have enough options! S’mores are definitely my favorite summer treat, and I love how you broke them down in 4 easy to make methods!